1. Are donations or sponsorship to Nying-Jey Projects tax deductible? 2. How do I know my money gets to the monk/nun/student that I sponsor? 3. How do I send letters/gifts to my student or nun? 4. What happens re my sponsorship once the child leaves school? 5. What is the suggested amount of money per month to give? 6. How much of my hard-earned money gets to my beneficiary? 7. How long am I committed to being a sponsor? I really want to help but my income can vary greatly from year to year. 8. What is the Medical Emergency Fund? 9. What is the difference between Sponsorship and Scholarship? No. The Australian Government only authorises tax deductibility for donations to organisations whose activities are defined under their criteria as “development”. Because all current Nying-Jey Projects’ programs are paid to and benefit individuals directly they are defined under the Australian Government guidelines as “welfare”. Welfare programs are not eligible for tax deductibility. The Nying-Jey Projects treasurer remits the monies to the beneficiaries in India and China 6-monthly to keep bank fees down. This saves our partners in Tibet from making the 2 day trip to Chengdu to collect the monies on a more regular basis. Our partners in Tibet telephone on receipt of the money to confirm its arrival and clarify any issues in regards to its distribution. They then distribute the monies to the Students and Nuns. The Ganzi committee in east Tibet have agreed to send us 6-monthly reports detailing their financial activities. 3. Can I send letters/gifts to my student or nun? The children especially, love getting correspondence from their sponsors. Surprisingly, a great number of letters received by sponsors are written in English. Many of our students learn English or have access to someone who can write an English letter for them – this makes communication between students and sponsors easier and quicker. No need to wait for translations. Send your English letter to Ganzi. Your student should be able to find someone to translate for them. 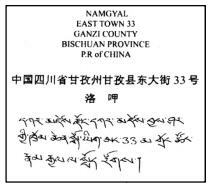 REMINDER: If you send letters to NJP for translation, please include a stamped self-addressed envelope so your letter can be returned to you for posting to Tibet. Our special Tibet address label (shown right) helps your letter pass from Australia, through China to Tibet. Three countries – three languages. Simply print, cut and paste onto the envelope. REMEMBER to write the sponsorship ID number on the envelope and the letter. 4. What happens to my sponsorship once the child leaves school? You will be notified by the Nying-Jey Projects secretary/treasurer if this situation occurs and given the option of sponsoring a new beneficiary. For students, $20 Australian per month is the suggested figure. This is enough to enable a family to keep a child at school without financial hardship. For tertiary students, $40 Australian per month will keep them housed, fed and studying at an institution away from home. If not all, then almost all of it. In the past, deductions have never exceeded 5% and have typically been much lower – between 2 and 3%. Deductions from sponsorship monies cover the running and administrative costs, which include: banking transaction fees, postage, stationery, newsletters, telephone charges and the like. Offsetting this, interest accrued from Nying-Jey Projects bank accounts can often actually cover these deductions. This is entirely up to you as you are not bound to any contracts. If you could contact the Nying-Jey Projects Secretary and inform them of any changes or if you are unable to continue with sponsorship, it would be appreciated. If contemplating sponsoring a tertiary student it would be better if you’re sure you’ll be able to continue until the end of their course, as it can be difficult to find a replacement sponsor for this greater amount. Some sponsors who do not want to be tied to a regular payment elect to make ad hoc donations to the Scholarship Fund, the Medical Emergency Fund or to Nying-Jey Projects to help with our administration costs instead. This is a program that provides financial assistance to the beneficiaries to cover the costs of emergency medical services and procedures. It can also provide financial relief for beneficiaries who have incurred large debts as a result of having expensive medical services and are struggling to pay their debts. Sponsorship is when one person takes responsibility for the ongoing upkeep of one school student, monk or nun. As the cost of providing for a tertiary student is so high, it is more practical for us to pool donations to support a student at university. Of course this doesn’t mean that you can’t sponsor a university student if you are confident of being able to continue that to the end of their course.